Who doesn’t love some ‘me time’ and indulging in a relaxing bath? Well, Lush have everything you need for the perfect pamper session and will take your bath from average to something special in a matter of seconds thanks to their scentual (get it?) bath bombs like Which Came First? (£6.95) and Free Rangers (£6.95). Which will you choose? The Liberty Top Tip: Can’t choose just one treat from Lush? Then grab a gift set and experiment with as many products as possible! When the weekend is extended, spending an afternoon watching a selection of films is a must and we have selected some old and new favourites from HMV to enjoy. To reflect the fun of the season, we’re starting with Hop (£2.99) and will be following the Easter Bunny’s adventures closely! Add some egg-cessive cuteness to lunchtime with this Periwinkle the Bunny Tumbler (£10) from Claire’s. Featuring a pretty lilac and rainbow colour palette and adorable bunny ears, it’s the only way to enjoy a beverage this Easter. During Easter, finding family friendly activities to keep the little ones amused can be difficult, which is why having a selection of colouring and sticker books on hand to fill a few hours can make the weekend so much easier for all involved. We love Waterstones range of fun activity books and have already picked up the Easter Sticker Book (£6.99). 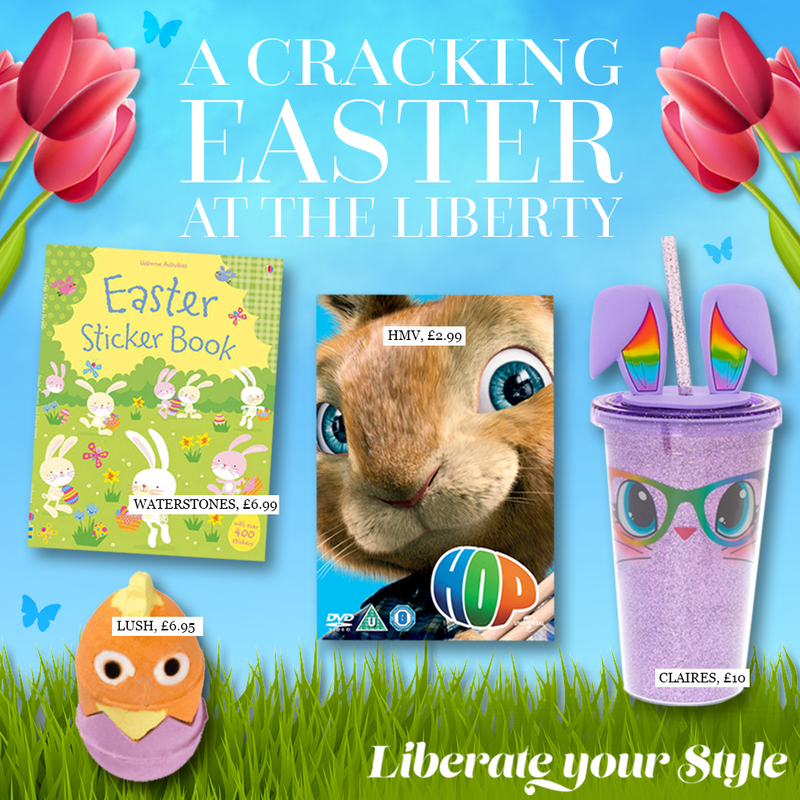 The Liberty Top Tip: Creating your very own arts and crafts with the kids couldn’t be easier! Head to Poundland and grab a variety of stickers and stationery today and unleash your creativity. For more inspiration and ideas, from fashion to home, don’t forget to follow us on Facebook, Twitter or Instagram.